Craning his neck, Deeks locked his eyes with Kensi’s unconscious form. Jasper had thrown her over his shoulder, an arm anchored behind her knees and her front draped over his back. Her long hair was a tangled curtain that swayed as he ambled away, Horace following close behind. Deeks knew Kensi was still knocked out from Angela’s attack. There was no way she would have gone so quietly, pinned against an inept thug. He was comforted and worried at the thought. Kensi putting herself in danger to save them would have been exactly like her but would have been foolish with the odds they were facing. But every muscle in him strained to go after her, to make sure Phin’s henchmen didn’t harm her. Deeks found Eric’s eyes, seeing the uncertainty swimming in the clear blue depths. He silently implored Eric to go along, or at least give the appearance of going along long enough for them to come up with a plan. They needed time. Time for someone to realize they were gone. Time for someone to find Nell. Time for something close to a miracle. Phin laughed, the sound hollow and cold. When he turned back to Eric his face was twisted into mocking skepticism and something almost like pity lit his eyes as he looked at Eric. “Says the guy with daddy abandonment issues,” Deeks muttered, loud enough only for Eric to hear. Phin must have caught the murmur of his words because he jerked his head to look at Deeks, narrowing his eyes. Eric covered by coughing, rousing up a series of hacking that sounded like he had a lung he was trying to eject from his body. “It’s the desert,” Phin said flatly. Phin studied Eric, finally seeming to decide to let the incident pass. When he turned away from Deeks and Eric to lead them down the hallway of the casino, they had no choice but to follow. Eric visibly sagged once Phin turned his scrutiny away. Deeks reached out, firmly squeezing Eric’s shoulder to let him know he knew it had been hard for him to stand up against Phin’s suspicion. Wincing a little at the tightness in his chest and the answering pang that rippled across his side, Deeks followed Phin, making sure to keep Eric behind him. It was automatic to try and protect his friend, broken ribs or not. They followed Phin deep into the casino, passing through the dark and dim hall where blackjack and craps tables were covered in dust, past the gaping mouth of an abandoned theater stage, and behind the old money cages. Phin paused in front of a large safe, already opened, the inside like a darkened cavern. It was impossible to tell how deep it went in the low light of the casino. The door of the safe was tall, reaching from the floor to the ceiling, and thick as an oak tree trunk. Deeks watched uneasily as Phin gestured towards the pitch black inside of the safe. “You want us to go in there?” Deeks asked, knowing it was an obvious question but asking all the same. Buying seconds meant eventually buying minutes. And they needed all the minutes they could get. “Don’t tell me you’re afraid of the dark,” Phin said. Deeks scratched his head. At the last second he caught the flashlight aimed for his chest. Deeks bit down the groan that nearly escaped his lips as he’d had to twist his arm to catch the plastic flashlight, the muscle movement aggravating his ribs. Which he noticed was too light and flimsy to serve as any kind of weapon. “But what about the hack? And what about proof of life for Nell?” Eric asked stubbornly. Eric nodded slowly, voluntarily entering the safe. Sighing because he had no other option but not liking the choice in front of him, Deeks followed. He flipped the switch for the flashlight, the golden beam cutting through the air to illuminate dust kicked up by their movement. The interior of the safe was large, probably about five hundred square feet in size. An unsteady wood table was in the center and the outer edge was stacked from floor to ceiling with small, medium, and large sized lock boxes, the metal fixtures caked with dirt, misuse, and time. With a creak that shuddered through the air, Phin closed the door to the safe, locking them in. The heavy pins of metal groaned as he turned the knob of the door from the outside, the hollow silence that followed foreboding and final. Away from Phin and with Kensi now separated from them through the innumerable walls of the casino and more distance than he was comfortable contemplating, Deeks felt his energy flagging. The arc of the light from the flashlight dipped down as his arm lowered and Eric quickly came around to his side, taking the flashlight. “You okay, Deeks?” Eric asked. Eric was surprisingly strong and steady as he took Deeks’ weight, helping lower him to sit on the floor with his back against one of the walls of lock boxes. Stretching his legs out in front of him, Deeks shifted carefully to find a position that wouldn’t cause pain to shoot through his side. Eric dropped to the floor next to him, sitting cross-legged and training the flashlight on the floor between them. The light bounced down and diffused slightly on the yellow linoleum, providing a glow that illuminated the area immediately around them but left the rest of the safe in shadow. They sat quietly for several long minutes, until the careening thoughts in Deeks’ head forced him to speak. “It was such a stupid argument,” Deeks said, shaking his head. Eric blinked three times rapidly, seemingly shaking his thoughts loose from the dire situation they were in. Exhaling impatiently, Deeks focused his eyes on Eric, frustration evident in the thin line of his lips. “Wasn’t she a showgirl?” Eric asked curiously. Deeks rolled his eyes. “Of course she is!” Deeks replied, his rebuke sharp and quick. Automatic and unthinking. Eric raised an eyebrow, telling Deeks that he’d intentionally led him down that path, had wanted to get that rise out of him to prove a point. “So maybe you should tell her that,” Eric said, his voice quiet. Looking around the dimly lit room, Deeks knew there was no real escape from the safe. They were truly at Phin’s mercy. But being stuck in a locked room didn’t mean they couldn’t try and formulate a plan for when they were set free. Eric’s eyes widened as Deeks’ words sunk in. Even in the barely there light of the flashlight Deeks could tell Eric paled a little at the implications. “We’ll know soon enough,” Deeks replied, keeping his voice confident even as he wasn’t entirely sure he could trust his own bravado. But he also knew Eric needed to hear it, needed to not be overcome by worry about Nell. “We were having fun, weren’t we? Before everything went to hell?” Deeks said, in an attempt to distract Eric and take his thoughts back to their earlier vacation weekend. “Just maybe not the destination, right?” Deeks replied with a wry grin. Eric’s laugh was a short bark. “Maybe next time we go somewhere that I’m not a noted criminal with watchdogs looking for me. And ex-friends who want me to help them build their criminal empires,” Eric said. Deeks smiled in return, glad to see that Eric hadn’t spiraled completely into worry and could still make a joke. “But what if I can’t find a way to get a message out?” Eric asked. “Then I’m going to work on Plan B,” Deeks replied. “What’s Plan B?” Eric asked hopefully. Eric blinked at Deeks’ confident and slightly irreverent tone, his mouth falling open as if he wanted to argue. But his attention was diverted by the sound of the heavy metal tumblers in the door of the safe shifting and the whine of metal as the door began to crack open, allowing light to spill in from the outside. Scrambling to his feet, Eric was quick to lean down and help Deeks up. Deeks ignored the pain in his ribs and straightened as tall as he could. And he glanced over at Eric in surprise when he felt him shift so that he stood slightly in front of Deeks. No weapon in hand, no real ability to fight their captors off and yet Eric’s first instinct had been to protect Deeks. 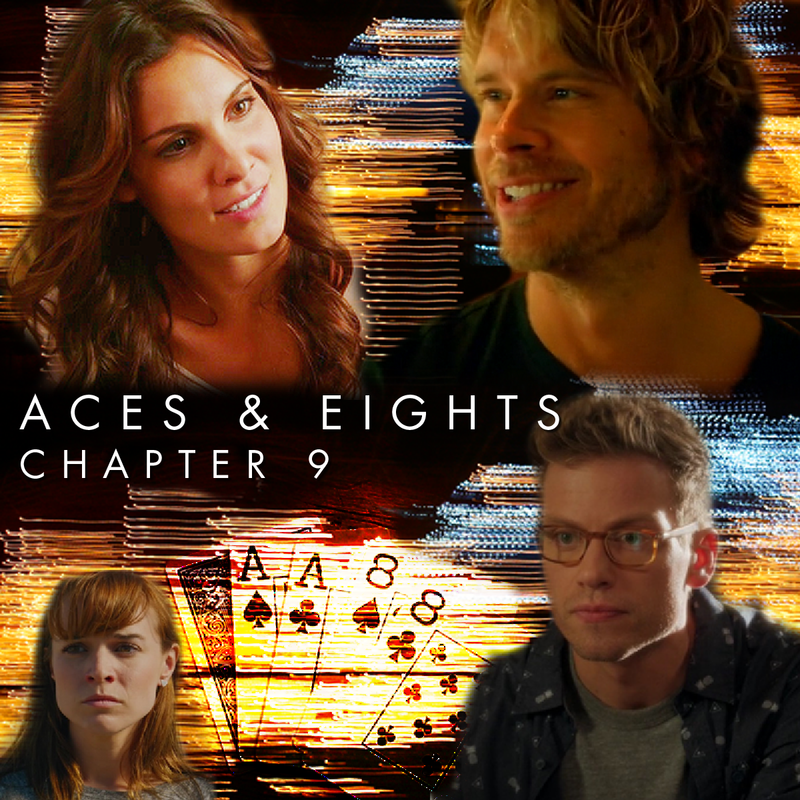 Not able to dwell on that more than a few seconds, Deeks squinted as the light from the casino filled the safe, followed by bright flashlights that blinded them both. They both looked down and away from the light just as footsteps alerted them that multiple men had entered the safe. They paused several feet in front of Deeks and Eric and then Phin entered their line of vision, holding a cellphone. He quickly flipped through a series of photos, showing the outside of a hospital and then a few close-ups of a badly bruised Nell in a bed that looked to have been taken by someone not particularly adept at shooting decent pictures. Even though they were blurry, Eric exhaled in relief and stumbled back against Deeks, who squeezed his shoulder gently. Historian, traveler, photographer, reader, writer, avid movie and television fan. Excellent. I felt my claustrophobia increasing as I read. Can’t wait to see what happens next. A nice chapter allowing us a little time to catch our breath and the team (or at least Eric and Deeks) to figure out a plan (and a plan B). Nice touches with Deeks regretting hurting Kensi’s feelings and Eric standing in front of Deeks for protection.